RP2W is a mobile robot made by SuperDroid Robots, and is the basis of the prototype E-Motion robot. 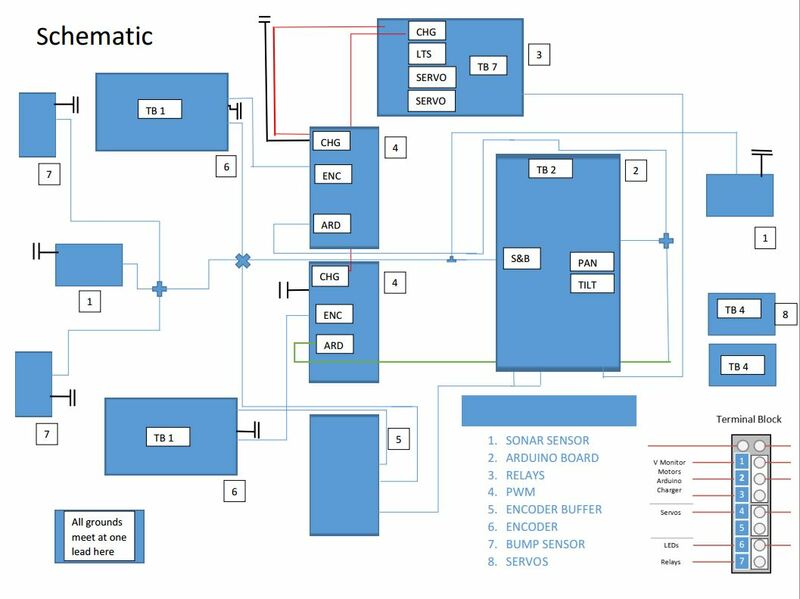 The figure below is the schematics for the electrical systems of the RP2W robot, a photo of which is shown at the top of this blog. The RP2W is equipped with dual 12 volt lead acid batteries each with their proper fuse. From there, the twelve volt batteries lead into a 12V-5V regulator and a 12V-6V regulator which are adjoined to the terminal block at the bottom right of the image. The terminal block supplies the power to most of the sub-systems on the robot that are listed above. The numbers 1,2,3 / 4,5 / 6,7 marking the individual rails on the terminal block correspond to 12V, 6V, and 5V respectively. As shown in the image the voltage monitor, motors, and power supply to the Arduino board are powered by the 12V supply. The Arduino board serves as the micro controller and is connected to the motors and sensors for data acquisition and control. The next component on board the RP2W is the relay which is used where it is necessary to control a power circuit using low-power signal. Each motor in the base is driven by a PWM amplifier controlled by two digital I/Os, one for +/- direction, one for ON/OFF. The PWM’s main purpose is to modulate the current flowing through the motors with digital means. In other words, the RMS current flowing through the motor is proportional to the PWM duty cycle. Each wheel is operated by a DC motor with a 24-bit digital encoder attached to it for position measurement. The encoders feed into a quadrature encoder with a counter that accumulates the count, which is, in turn, read by Arduino. On the front end of the RP2W, one will find two bump sensors (button switch) and a sonar sensor. The two button switches are connected in parallel with one side tied to 5V through a 10k ohm pull-up resistor. The other end are tied to ground. This configuration allows Arduino to detect bump when either switch is pressed. 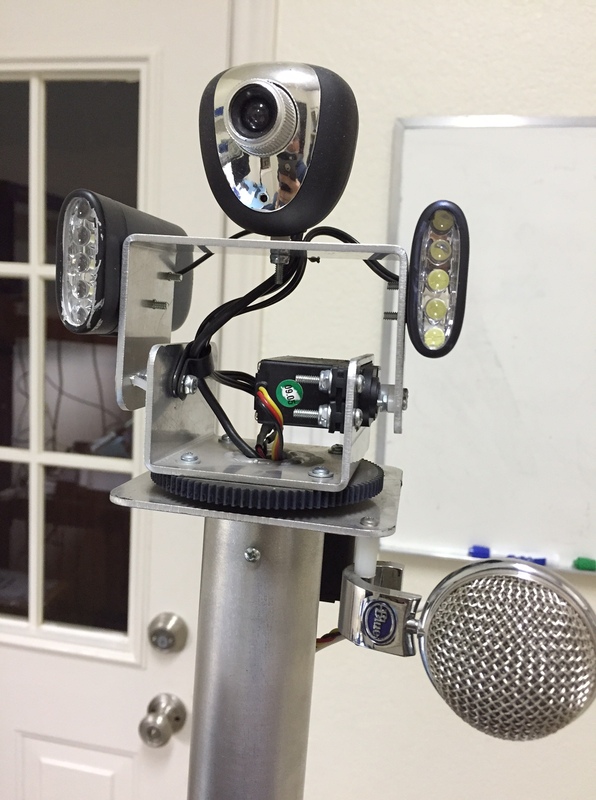 A pan-tilt camera located at the top of the robot is powered by two RC-servos. They allow the camera to pan and tilt based on user input. They are controlled by Arduino. Careful analysis of these components and further research of their functions will permit us to add and modify the sub-systems of the RP2W.